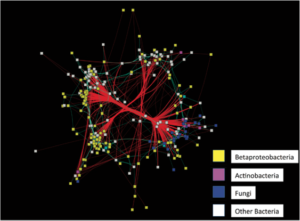 Co-occurrence analysis of bacteria and fungi found on boreal toads. In this study, Woodhams and collaborators at the University of Colorado, Boulder led by Jordan Kueneman (now Ph.D.), used high-throughput 16S and 18S rRNA gene sequencing (Illumina MiSeq) to characterize bacteria and microeukaryotes from boreal toads. Life stage had the strongest influence on the skin microbiome. Fewer Bd-inhibitory bacteria were detected in post-metamorphic stages correlating with increased skin fungi, suggesting that bacteria have a strong role in early development and reduce skin-associated fungi. Kueneman JG, Woodhams DC, Van Treuren W, Archer HM, Knight R, McKenzie VJ. (2016) Inhibitory bacteria reduce fungi on early life stages of endangered Colorado boreal toads (Anaxyrus boreas). The ISME Journal. 10:934-944.